If dates are such an important fruit in this part of the world, why on earth does Dubai not have more specialty dates stores (beyond Bateel or occasional mall kiosks)? 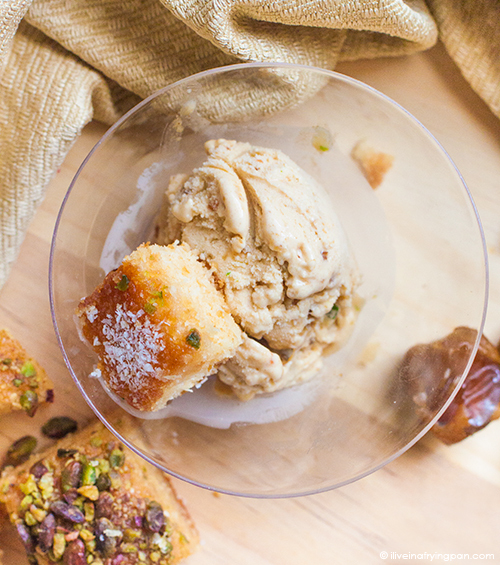 Why haven’t we sparked a trend of glamorous date desserts? I don’t mean just the token date ice cream, but something brilliantly creative. 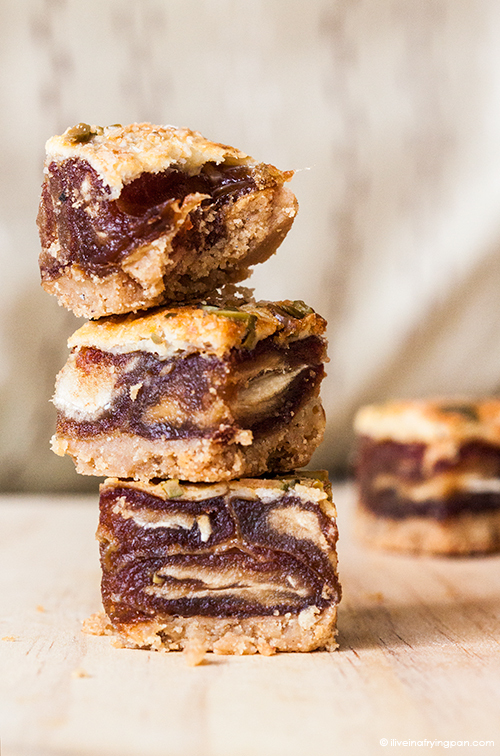 A date dessert stunner if you will. It’s almost as though we’re waiting for, I don’t know…maybe California…to start a date dessert trend and then we’ll promptly import the brand and the dates from the West Coast so we can replicate the trend here. Till that sweet sticky moment is born in the future, we’ll just sit tight on the unhatched possibility of doing wildly exotic and romantic combinations with dates that have been an inseparable part of this region, its culture and its religions since the times of Ancient Egypt. Till that moment, we'll all just focus our energies on…I don't know...baking cupcakes. Until that glorious day when Dubai embarks on its predestined date dessert revolution, I’ll keep experimenting with this versatile sugary fruit using my humble home ice cream maker. The date harvest corresponds neatly with the hot summer months (I got my hands on some fleshy barhe dates during July/August last year), which means that rather than moaning about the insufferable heat, a better occupation would be to scout out plump rutab dates to swirl into your next batch of ice cream. Rutab dates are the only ones I like to use for an ice cream. These are dates in their third stage of ripening, just as the astringent fibrous interiors of khalal morph into fleshy sweet rutab lava. As the date becomes increasingly plump and moist, its skin starts ripping and exuding sticky juice at the seams. 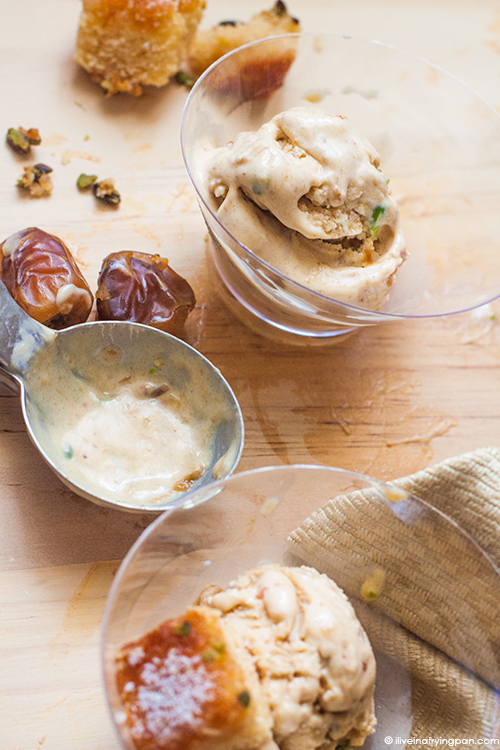 The creamy, toffee-like bellies of those rutab dates are primed for ice cream. Of course, Rutab has an audience far wider than the patrons of my ice cream churning efforts. The Liwa Dates Festival is timed to coincide with the harvest of rutab dates, which means that it’s been scheduled for July of this year despite it being Ramadan. A festival that falls any later will miss that critical peak of burstingly soft rutab, which means that date experts and growers would rather work around Ramadan timings than postpone the festival. All the better I say, because rutab puts to shame the drier tamar (final stage of ripening) that we find all year long in the supermarkets. For all my date ice cream experiments (or any ice cream experiments for that matter), I use David Lebovitz’s vanilla ice cream recipe and simply skip the steps involving the vanilla bean infusion. For 750 ml of ice cream mix (2 cups cream, 1 cup milk), I tend to use about 1 packed cup of pitted rutab dates. I typically macerate the dates in orange juice overnight before blending them into the milk that will eventually become a part of my ice cream custard mix. The maceration softens the inner dates fibres and makes them easier to blend into the milk, while the orange juice adds a refreshing citric twist that prevents the ice cream from becoming sickly sweet. Sugar is a big no-no in this ice cream, I’ve added it in the past and landed up with something that induced a dangerous sugar coma two ice cream licks in. 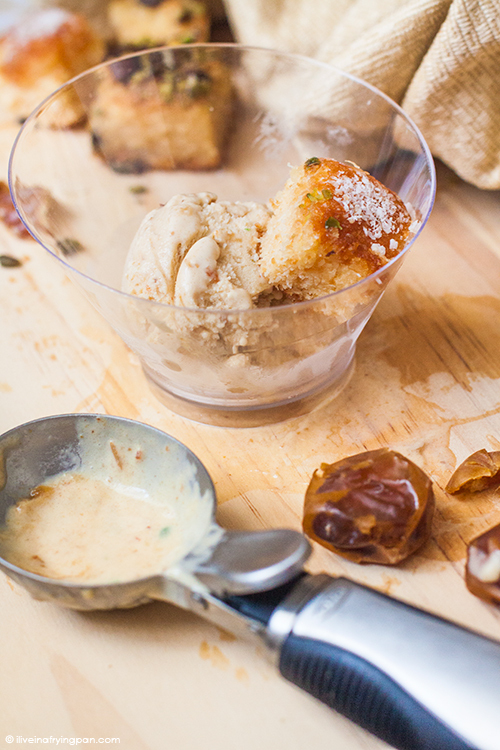 The beauty of dates is that their flavour is a sociable one – pair it with something else in the kitchen pantry and churn out an ingenious combination. My attempts have started out with the basics (yes, I’m guilty of the token date ice cream too), and I’m gradually trying to branch out to more experimental flavour pairings. I’ve substituted a cup of cream with a cup of creamy mascarpone cheese, a few strands of saffron (thrown into the custard) and a teaspoon of orange blossom water in the past. The churned result was a dreamy, flowery concoction that was consumed so quickly that it was, well…maybe all just a dream. I will admit that the sourness of the labneh was shocking at first, even bordering on unpleasant. But after letting the ice cream rest in the freezer for a week, the sourness mellowed out and the flavour grew on the ice cream patrons around me. This might be one of my most rich and heavy ice creams churned thus far, even beating out a pure chocolate version. In hindsight, I’d pick the more subtle mascarpone pairing over hung yoghurt any day for a future churn experiment. 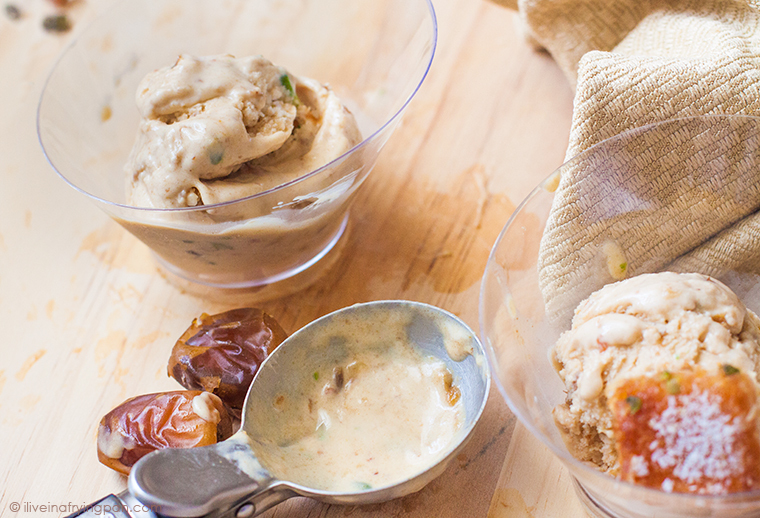 Other date ice cream matches that I plan to hook up during the rutab season in July include: dates and tahini, salted date caramel and maybe to keep things traditional, jallab with pine nuts and raisins, or dates with gahwa. Think I’m missing a wildly obvious or superbly counter-intuitive date combo? Tell me, I’m game to churn. Royal Khalas Malaki Dates on Abu Bakr Al Siddique Road. Carrefour is currently stocking Sukari rutab dates. 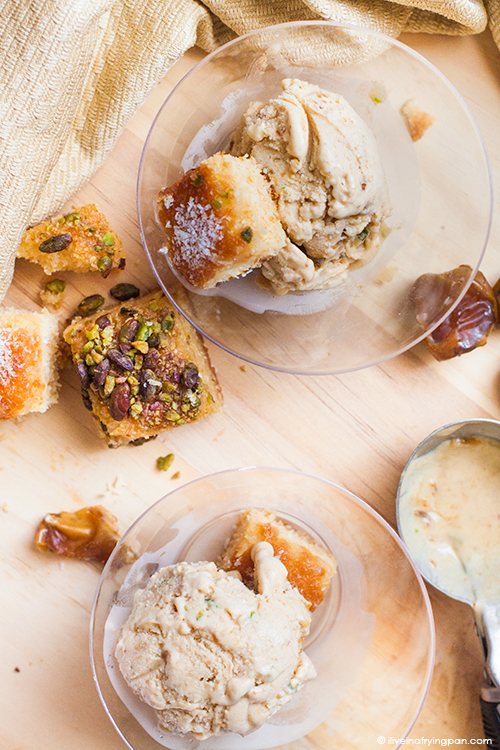 ← Older: Stepping into a Palestinian-Jordanian home for Iftar. Oh my gosh I’m going to try this combination. I have made frozen yogurt in my ice cream machine, but not frozen lebneh. Terrific idea. And of course, dates. Now I know which ones to use… I hope we’re on the verge of a date dessert trend. Brilliant! You and Shaikha Ali… both of you should collaborate on an Icecream Revolution in the UAE… I will have to lure you with my mishti doi for all the icecreams you are churning up! Thanks Ishita! I just met Shaikha on a food trail yesterday and adore her posts on Instagram, what a foodie force! I think she definitely has a headstart on me, but every time I see her flavours, I feel like screaming, OMG YES, you read my mind baby!!! 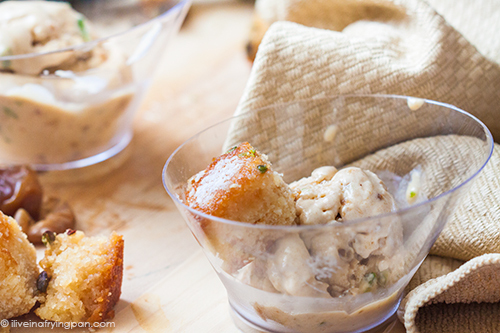 Now you know how ambivalent I am about icecream – but you’ve turned my head with this post. Fabulous writing. I wonder if the teeniest, tiny shake of sumac would add a lemony spiciness to the date? Hi Arva , this looks delicious , worths to try it , yes I agree with you that we lack of more creative cafés and dessert shops using dates in their recipes other than the old well known desserts we all know. I m sure you have this book for Sara AlHamad Sun Bread and Sticky Toffee ( date recipes from everywhere) interesting book. I have tried some recipes from this book and they were yummy and different . Thanks Maysaa! I don’t know why on earth I don’t have this book (I have her other one – Cardamom and Lime). Got to get it on my next Kinokuniya trip – thanks for the recommendation!